We're off to Royal Surrey this morning to meet Piet and the team for the 6 week check up following Jake's cleft palate repair. I am convinced that some further surgery will be required but am hoping upon hope that none will be and that everything is healing nicely. Other than being what some would describe as a pessimist, but what I would describe as a realist, my reasons for thinking this are that food is still coming out of nose when he sneezes after eating and there is air escaping down through his nose. We can't see a hole but the professor did say that Jake had a short palate when he brought the sides of it together and that he managed to lengthen it. So basically there is a bit at the back of his palate which actually wouldn't have been there if he hadn't been born with the cleft. This is the only part of the repair which is fabricated. Not fabricated in as much that anything has been added but that it has been put into a position which it has no right to be in. And therefore, perhaps this is the most likely point of failure in the whole process. Maybe I'm worrying unduely (and I hope I am) but I like to deal in science and high percentages, I'm not reallly a gambler and err on the side of caution so, it seems to me that it's more likely than not that this is where the problem will lie, if at all. A short palate may not mean more surgery of course, it may just need some speech therapy and coaching. In fact more surgery will only be required for developmental or social issues which a fistula (small hole) or short palate would cause. Of course, food coming out of your nose when you eat would be considered a social problem - I can't imagine the kids at his school turning a blind eye....anyway we'll see and I'll report back when we know. On a brighter note, Jake's sleeping is getting much better. As regular readers will know, I like to moan about his sleep pattern so it's only fair to inform that he has been going through until 5.20am worse case and, like at the weekend and this morning, 7.20! That is very nearly as good as before he was born. I'm not anticipating the need for an alarm clock again just yet but it does seem that after 10.5 months of disturbed and deprived sleep we are nearly there. 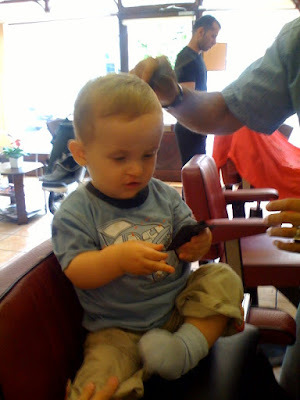 Lastly, a momentus occasion last week saw Jake at a barbers having his very first haircut. Clare resisted until the last moment but when even her brother mentioned that his curls were getting out of hand, something had to give. We kept some of his mop for posterity, but here's a picture of his smart new hair cut! After his haircut, he's still packing more hair than his old man! Boy is he growing up fast.